Explanation: A star cluster around 2 million years young, M16 is surrounded by natal clouds of dust and glowing gas also known as The Eagle Nebula. This beautifully detailed image of the region includes cosmic sculptures made famous in Hubble Space Telescope close-ups of the starforming complex. Described as elephant trunks or Pillars of Creation, dense, dusty columns rising near the centre are light-years in length but are gravitationally contracting to form stars. Energetic radiation from the cluster stars erodes material near the tips, eventually exposing the embedded new stars. 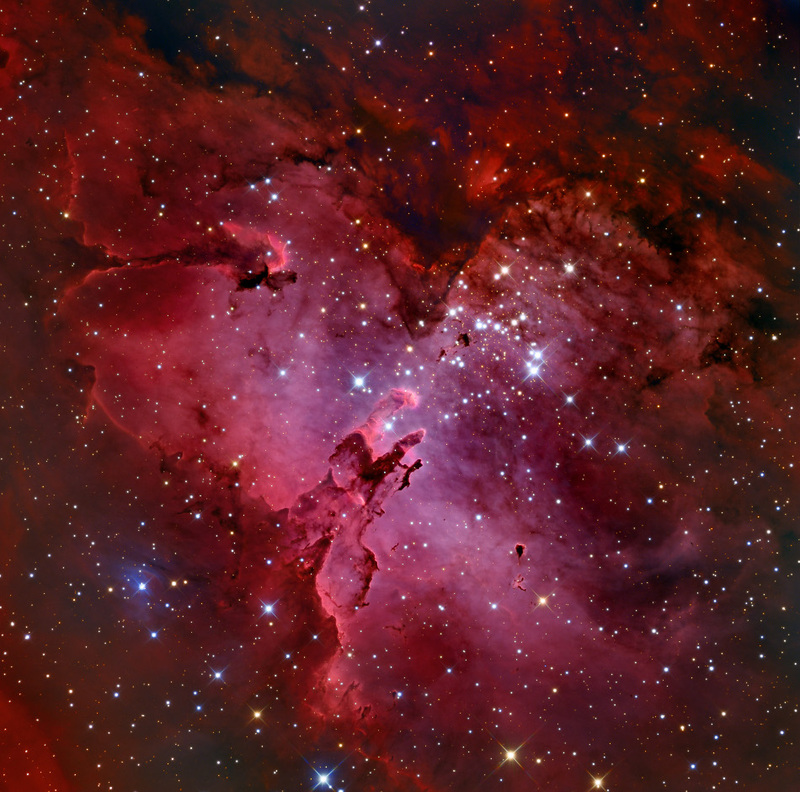 Extending from the left edge of the frame is another dusty starforming column known as the Fairy of Eagle Nebula. M16 and the Eagle Nebula lie about 7,000 light-years away, an easy target for binoculars or small telescopes in a nebula rich part of the sky toward the split constellation Serpens Cauda (the tail of the snake).